Description : It contains 20 lectures of Rama, one of them was delivered in Japan and rest in America. Description : It contains 37 lectures and talks of Rama. 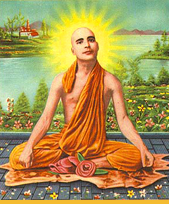 All these deal with the various aspects of Vedanta in an appealing and attractive manner. Description : Important topics regarding Vedantic conceptions have been delt with by Rama is this third volume and these include 26 chapters and also scattered letters of Rama. Description : This volume contains 20 chapters including English version of �Upasana', the only article available or Rama in Hindi which deals with various facets of Devotion and two articles of Rama about Mathematics which Rama wrote as a professor for the guidance of students. Description : This volume contains English Version of 12 articles, originally written by Rama in Urdu and published in the magzine� ALIF� before he took up Sannyasa. � ALIF� magzine was brought out at the behest of Rama and shows the mature thinking about � Self� Realization' by Rama. Description : This volume contains lectures delivered by Rama at various places particularly in U.P. (India) The notes of these lectures were taken by the devotees of Rama on whose basis the shape of these lectures was structured. Special care has been taken to bring out the genesis of what Rama explained then. Description : This volume contains unique collection of various Note � Books by Rama which were somehow procured and later on published. These note � books are virtually a compendium of sayings, quotations and wonderful utterances dear to Rama. These naturally inspire, motivate and satisfy an inquisitive mind, labouring hard to grasp TRUTH and acquaint him what he is. In this Volume only eleven note � books of Rama could be published. Two, as they say, were forfeited by the then British Rulers of India and were ruined.